A business’s online activities can put it at risk of being subject to lawsuits in other states or even foreign countries. 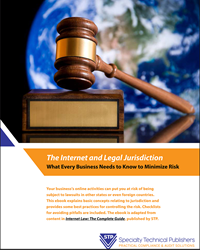 Internet experts and attorneys Eric P. Robinson and Steven D. Imparl have written an informative complimentary eBook which explains basic concepts relating to jurisdiction and provides some best practices for controlling the risks. Checklists for avoiding pitfalls are also included. The eBook is adapted from content in Internet Law: The Complete Guide, published by Specialty Technical Publishers (STP). In order for any court to hear a legal dispute and enter a valid judgment, it must have jurisdiction over both the plaintiff and the defendant. Jurisdictional questions related to cyberspace typically address whether a court has jurisdiction over the individuals or entities (known as personal jurisdiction). Such disputes are inevitable, because the Internet transcends state and national boundaries and fosters much human interaction that might not have occurred but for the Internet. Ordinarily, a state court’s personal jurisdiction is based on whether the people, businesses, transactions, or events at issue in the case lie within the state’s physical territory, and the Due Process Clause of the Fourteenth Amendment limits the states’ ability to assert jurisdiction over nonresident defendants. However, these traditional geographic limits no longer adequately define jurisdiction in a world where commercial transactions are routinely conducted in cyberspace by parties living thousands of miles apart, who may not even know where the other party is located in a geographical sense. If a site exists “on the Web” that allows commerce with anyone from anywhere that has Internet access, is the owner’s business address really relevant? A seller may have a brick-and-mortar shop in Tennessee, a website hosted by a server in California, a warehouse in Kansas, and customers dotted around the globe. “Where” then, is this business “located”? One of the ways courts are adapting to this new situation is by redefining personal jurisdiction to be based on more than simple physical location. Unfortunately, many businesses remain unaware of these shifting sands of culpability that may leave them vulnerable. This eBook will help reassess a business’s online activities with a view to reducing the danger that the business will be subject to personal jurisdiction in areas outside their state. Long-Arm Statutes Reaching Out Across Borders. Eric P. Robinson, JD, PhD is an attorney and scholar focused legal issues involving the media, including the Internet and social media. He is currently assistant professor in the School of Journalism and Mass Communications at the University of South Carolina, focusing on media law and ethics. Steven D. Imparl, JD, holds a law degree and a Bachelor of Science degree, With High Honor, from DePaul University. He resides and practices law in Chicago, Illinois, concentrating his practice in Internet, e-commerce, and computer law. STP has also recently released a new chapter on U.S. Social Media Law. This standalone chapter is part of STP’s Internet Essentials series and can be bought for US$89. Read more.